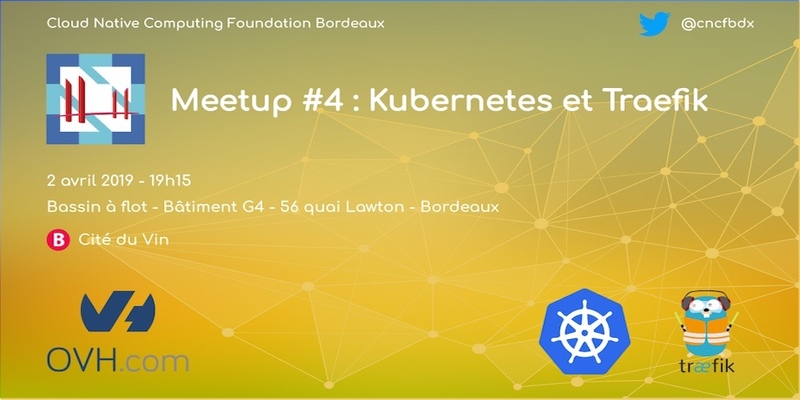 Nous nous sommes ravis de vous convier à ce 4ème meetup CNCF à Bordeaux ! Un grand merci à OVH qui nous hébergera et sponsorisera ce meetup #4. Kubernetes – Engineering Manager @OVH. Working at OVH for three years, he led the Metrics team and now works on the Kubernetes platform. Passionate by his work Kevin loves to share his experience and insights on how OVH operate stacks in production. How does OVH use Kubernetes to provide Kubernetes infrastructure for its customers? As of today, Kubernetes is set as the standard for container orchestration and deployment. OVH has built an infrastucture that uses the functionality and velocity of Kubernetes to deliver a seamless Kubernetes experience to customers. Why did we choose to build Kubernetes over Kubernetes? What are the main stakes when designing such an architecture? What problems did we encounter? How did we deal with theses issues? Emile Vauge is founder and developer at Containous and the creator of Traefik. He has more than 10 years experience developing applications for both the web and industrial uses. He loves containers, orchestrators and gophers. 21h – Nous nous retrouverons, comme d’habitude, pour échanger autour d’une bière et d’une part de pizza offertes par nos hôtes.